Concrete Round Picnic Tables Cement Consturction - Picnic Table Store-Commercial grade quality-lowest price. 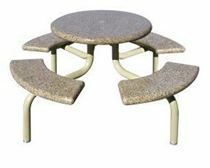 Shopping for a round concrete picnic table that is an environmentally responsible and economical choice? The tables we sell made from commercial grade cement are made by the nations largest concrete outdoor furniture company. Think of a concrete design and we have it. These round picnic tables are constructed from reused concrete and reinforced steel materials . Heavy duty picnic tables are typically a one time purchase, making a better investment for your company with less impact on the environment at the same time. 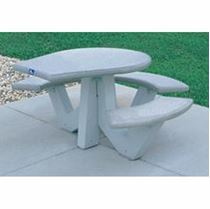 All of our concrete picnic tables meet ASTM standards! Call our professional consultants for prompt immediate service. Concrete Round Picnic Table with Bolted Concrete Frame, 1100 lbs. Round Concrete Picnic Table with Polished Bullnose Top and Seats with a Powder Coated 2" Steel Tube Frame, 800 lbs. Round Concrete Picnic Table with Pedestal Concrete Frame, Seats 6 Adults, 1,115 lbs. Picnic table Supplier has the largest selection of round picnic tables compared to any other competitor! What ever you need we can help you find it! Round picnic tables are a favorite in schools and cafe settings because they create a natural social environment. The round shape encourages conversation, making it great for meetings. Add a round picnic table to your corporate office and take your meetings outside on a nice day!